There are insane levels of wealth in the Palestinian territory. There are palaces everywhere, not just in Ramallah, but in tiny villages scattered across the land. Is this where the billions of dollars donated to the PA have gone? Prime Minister expressed optimism about the prospects of peace in the Middle East and underscored Israel’s evolving and rising status in the region. Despite the regional turmoil and the looming dangers, Netanyahu said he was “encouraged” by the situation. “Our relations with the countries of the world are flourishing in an unprecedented manner. Our relations with the moderate countries in the Arab and Muslim world are being forged openly,” he stated. Earlier this month, Netanyahu visited the Gulf country of Oman and met with its ruler Sultan Qaboos bin Said. It is the first trip made by an Israeli prime minister since Shimon Peres in 1996. Israeli Sports and Culture Minister Miri Regev and Communications Minister Ayoob Kara have recently visited the United Arab Emirates (UAE). Regev attended the Abu Dhabi Judo Grand Slam, where the Israeli team won two gold medals and had the Hatikva national anthem played for them. Kara spoke at a communications conference in Dubai. “We will move forward with our neighbors who want peace, and many do,” he stated. On Sunday, Israel and Chad renewed ties, 46 years after they were cut off, as Chad’s President Idriss Deby met with Netanyahu in Jerusalem. Netanyahu will soon make a visit to the Muslim-majority African country, where they plan to establish full diplomatic relations. Israeli media estimates that Israel is on the way to establishing ties with Sudan in Africa, currently in a state of warfare with Israel, and with the Gulf state of Bahrain. Following the Airbnb decision to give in to the BDS campaigners, the Simon Wiesenthal Center is urging its 400,000 constituent members and Jews the world over to boycott Airbnb after its CEO announced it will no longer allow its services to be used by Jewish residents on the West Bank. “This is double standard anti-Semitism pure and simple. Nowhere else on the planet has Airbnb stopped making its service available in disputed territories, except Judea and Samaria,” said Rabbis Marvin Hier and Rabbi Abraham Cooper, SWC Founder and Dean and Associate Dean and Director, Global Social Action Agenda. “To be clear, no Israeli leader, left, right, or center, would ever return to the indefensible ‘Auschwitz borders,’ a term coined by the founder of Israel’s peace movement, the late Israeli Foreign Minister, Abba Eban,” they added. "We take note that Airbnb has no problem doing business in the territory of the Palestinian Authority, which names schools and shopping centers in honor of mass murderers who have killed innocent civilians and have a ‘pay to slay’ policy when it comes to killing Jews. “We don’t expect Airbnb to be geo-political experts, but today’s draconian and unjust move, which only empowers extremists and terrorists, merits only one response—taking our community’s business elsewhere," the Rabbis concluded. Why is Israel Suspicious of United Nations? 1. Before 1990, Security Council passed 175 resolutions, 97 were directed against Israel (It is 55% of all resolutions). 2. Before 1990, UN General Assembly voted on 690 resolutions, 429 were directed against Israel (It is 62% of all resolutions). 3. The UN was silent when Jordanians destroyed 58 Synagogues in Jerusalem. 4. The UN was silent while the Jordanians systematically desecrated the ancient Jewish cemetery on the Mount of Olives. 5. The UN was silent while the Jordanians enforced an apartheid-like policy of preventing Jews from visiting the Temple Mount and the Western Wall. 6. The UN was silent while for 18 months Israel was terrorized by indiscriminate suicide bombing campaign unleashed by PA leadership. 7. There are 60 Muslims countries in the UN. As well as many more are others Arab oil dependant states. 9. Israel is the only country excluded from the UN's regional group system… Since Israel does not belong to any group, it is the only country of 190 member states that is not eligible to serve on the numerous UN commissions. 11. Nov. 29 is the United Nations Day of International Solidarity with the Palestinian People. No other people have a UN Day of Solidarity! 12. Israel is the only state to which a special investigator with "an open-ended mandate to inspect its human rights record" is assigned by the UN. 13. It is the only state targeted by two special committees and special units of the UN Secretariat ostensibly devoted to the Palestinians but in reality dedicated to Israel-bashing worldwide, costing millions of dollars a year. 14. UNIFIL, the UN force stationed on the Israel-Lebanon border, hid a videotape of Israeli soldiers being abducted by Hezbollah in October 2000. After finally admitting to having the tape, the UN would only show an edited version (in which Hezbollah faces were hidden) to the Israeli government. At least 11 Palestinians were reported killed in a series of wide-scale airstrikes carried out by Israel Air Force (IAF) in response to some 400 rockets fired from Gaza at southern Israel since Monday afternoon, claiming the life of a 40-year-old Palestinian man who was in Ashkelon illegally. IDF Spokesperson Brig. Gen. Ronen Manlis said "We are in the midst of a wide-scale process of accumulating more infantry, armored and other forces to the area adjacent to the Gaza Strip, and we are mobilizing reserves for Iron Dome operations and the Home Front Command," he said. 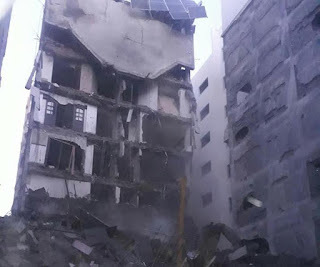 “We struck four multi-story buildings that Hamas uses for terror activity. We attacked the buildings in an orderly manner after the inhabitants have been evacuated," he explained. "Hamas is behaving as if we have moved on to targeted assassinations, as their men have been in hiding since Monday afternoon," Manelis added. 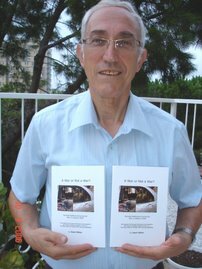 "Hamas knows very well what we are attacking and what the cost of the confrontation with the IDF is. We will continue to act with full force,” Manelis wrote on Twitter. The IDF spokesman added that in light of the escalation of hostilities, the evacuation of the Gaza border communities’ residents is something the military is considering, although it is not yet necessary. In response, the armed wing of Hamas threatened to step up attacks and fire rockets at the southern cities of Ashdod and Be'er Sheva if Israel continues to carry out airstrikes in Gaza. The spokesperson for Islamic Jihad went as far as to imply the faction will strike the center of the country next. 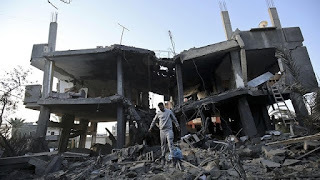 The IDF said some 150 targets were attacked in the Gaza Strip on Monday evening and overnight Tuesday, including the Gaza City headquarters of Hamas' Al Aqsa TV station. Israel had fired warning shots ahead of the airstrike, prompting the station to halt programming and replace it with a logo. Minutes later, the airstrike flattened the three-story building and the station went black. "The station broadcasts violent propaganda against the State of Israel and its citizens, as well as operational messaging to militants, which include methods for carrying out attacks against civilians and soldiers and way to obtain weapons," the IDF said. Hamas spokesman Fawzi Barhoum condemned the bombing as "a barbaric, brazen aggression." Ten minutes later, the station resumed broadcasts, airing pre-recorded national songs. Senior Hamas official abroad Izzat al-Rishq said, "We are holding talks with a large number of Islamic Arab countries, as well as with western countries and international organizations to condemn the escalation caused by the Zionists, and to end the ongoing aggression against our people, during which innocent civilians are hurt. 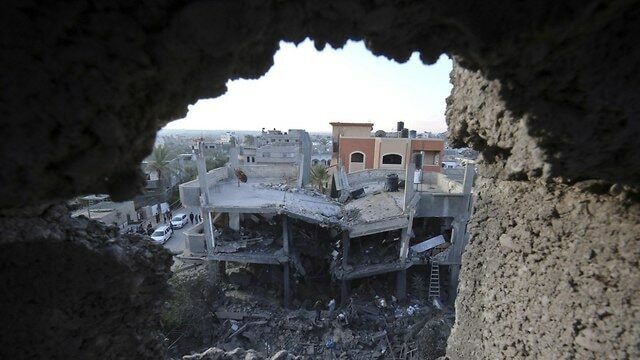 The IAF also hit Hamas's interior security headquarters, which were disguised as the Al-Amal Hotel. The activity conducted in the structure apparently included the planning of terror attacks against Israeli targets. The hotel is located in the heavily populated a-Rimal neighborhood in the northern Gaza Strip. Gaza’s health ministry is located nearby. 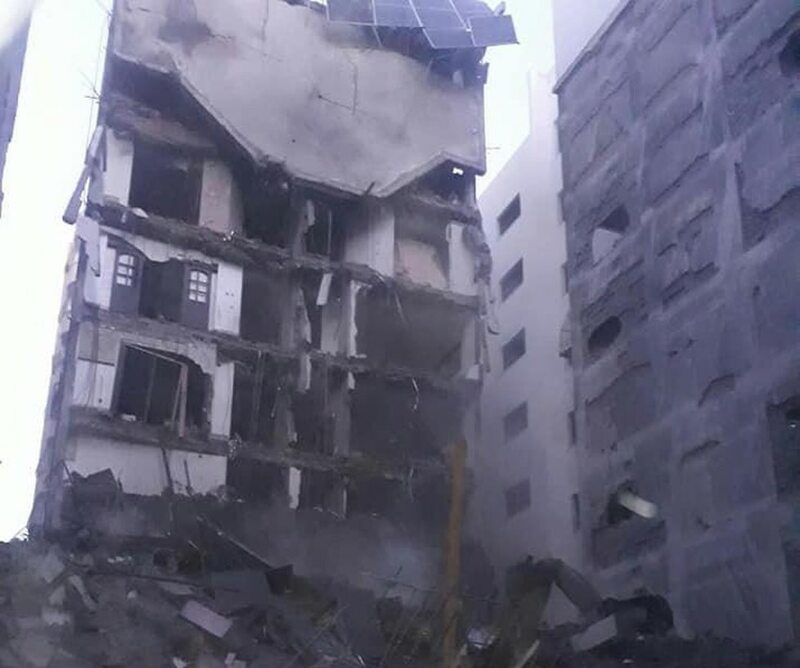 Another high-quality target attacked was Hamas' military intelligence force for research and development—a high-rise structure located near a school. In addition, the IAF hit a weapons storage facility in Khan Yunis, a military complex in Zeitoun, and a weapons manufacturing site in Sheik Omdan. The Israeli Navy attacked a vessel belonging to the Hamas naval force at the Nuseirat port in the southern Gaza Strip. These strikes represent an escalation in the IDF's response, as it has resorted to softer targets over the past few months. The Security Cabinet convened Tuesday to decide on the next steps of fighting against Hamas. Meanwhile, an IAF aircraft struck a terror cell launching rockets in northern Gaza, during which one Palestinian was killed and another was wounded, according to the Palestinian health ministry. In addition, two Palestinians breached the security fence at the Karni crossing in northern Gaza. They sabotaged the fence and shortly thereafter returned to the strip. Five thousand people, 175 companies and representatives from more than 80 countries are set to attend a flagship homeland security and cyber defense conference starting Monday in Tel Aviv. The fifth biennial International Homeland Security & Cyber Conference will present Israeli know-how and technology that has propelled the country to the forefront of the world’s security industry, both on the ground and online. Among those due to address thousands of conference-goers at Expo Tel Aviv are the head of the Shin Bet (Israel Security Agency) and Director-General of the Israel National Cyber Directorate , as well as executives and government officials from countries, including the United States, Cyprus, Germany, India, Italy, Singapore, South Korea and Spain. US Transportation Security Administration Chief Information Officer Russell Roberts and New York Police Department Commissioner James P. O’Neill are set to provide attendees with an American perspective at the conference, which is backed by a range of government bodies, including the Israel Export Institute, the Economy Ministry and the Innovation Authority. Alongside the keynote addresses and panels will be a large exhibition showcasing an extensive array of innovative technologies designed by 170 Israeli companies in the fields of national security, intelligence, crowd protection, mass transit security, cybersecurity and financial tech. Adiv Baruch, chairman of the Israel Export Institute and the conference, told The Jerusalem Post that the conference represents one of the “main pillars” positioning Israel as a leader in the homeland and cybersecurity innovation fields. In addition to the exhibition space featuring Israeli innovation, the conference supports companies by arranging business-to-business meetings with visiting officials, including chief security officers and procurement managers. Some 2,500 meetings have already been arranged prior to the conference. “The conference brings the decision-makers to Israel rather than Israeli companies chasing the market and committing to additional expenditure. In a very condensed period of time, we are exposed to a large sum of decision-makers in that space,” Baruch added. Israeli companies operating in the fields of homeland and cybersecurity, he said, are expected to exceed $10 billion in exports this year for the first time. Four thousand college students from 60 countries gathered in Tel Aviv in October for the latest mass singalong sponsored by the social music project, Koolulam. The event, at Ganei Yehoshua, was attended by GA 2018 participants, graduates of MASA programs, MASA CEO Liran Avisar Ben Horin, Jewish Agency Chairman Yitzchak Herzog, Government Secretary Tzahi Braverman, and Masa Chairman Ilan Cohen. Koolulam was founded with the goal of strengthening society through mass singing events in which large groups of non-professionals come together to create a collaborative happening. The organization gathers as many as 12,000 people at a time from a broad spectrum of Israeli life, and then films the joint singing productions to share on social media. In June this year, Jews, Muslims and Christians joined together at the Jerusalem Tower of David Museum to sing Bob Marley’s “One Love” in three languages as a show of unity from Israel. The video of the event went viral.